The theater of the criminal and absurd continue. Merril Lynch reported that Israeli millionaires' net assets rose from $43 billion to $52 billion in 2010. Apartheid Prime minister Netanyahu announced that he will strip Political prisoners held by Israel of basic rights like the right to continue their education. It is believed this announcement came in response to his unwillingness to exchange prisoners with Hamas (sad note: leaked documents showed that Abbas authorities lobbied hard against any release of prisoners in exchange for a captured apartheid soldier). Israeli Occupation Forces (IOF) also invaded several Palestinian communities in the past few days including setting up flying checkpoints in the middle of area A (Palestinian "security forces" withdrew upon orders from Israeli commanders). This also happened in my village of Beit Sahour (one young man was kidnapped by the invading IOF criminals) the same day that our mayor had departed town to Jordan. Syrian troops killed 15 demonstrators Friday. 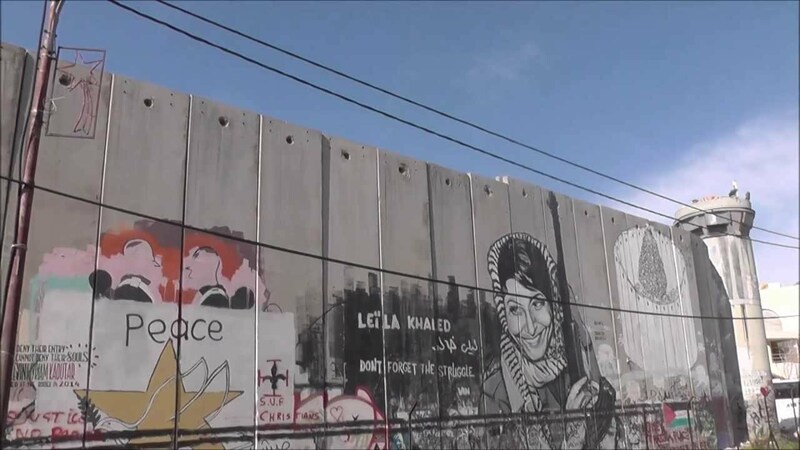 Bil'in residents tried to bring down the apartheid wall separating them from their land. NATO forces killed a Palestinian family in their raids in Libya "Palestinian ambassador to Libya Atif Udah told Ma'an radio the family was in a three-story building targeted by a NATO air attack. He identified the victims as Abdullah Muhammad Ash-Shihab, his wife Karima and his 6-month-old twins Khalid and Jumanah." And Fatah and Hamas seem to have backed down on their promises to the Palestinian people about forming a technocrat government and to allow for a representative PNC of the PLO. It is difficult to know though what is happening behind the scenes: my feeling is that the growing civil society participation and pressure on all these governments and quasi-governments is putting them in a very difficult spot. But more needs to be done by us to tip the balance and uthorities still resist doing what is right. Perhaps that is why the US government, instead of demanding Israel comply with international humanitarian law, had to send three outwardly threatening statements to its own citizen about joining the freedom flotilla (see below). The European Union meanwhile while visibly showing no sign of weakening its complicity in war crimes is working feverishly behind the scenes to respond to the changing political landscape. A high level official told me privately that what we are doing at the grassroots level is getting lots of attention behind closed doors and at the highest levels of Western capitals. I always reiterate that silence is complicity especially at this extremely sensitive period in our history. For us here in Palestine and abroad, activists are focusing on the flotilla (http://www.freedomflotilla.eu/) and on the July 8-16 initiative (http://palestinejn.org ). We hope you will give your support. Many volunteers are needed especially to disseminate information via the internet and increase pressure on mainstream media and politicians to finally make the right choices and end the last remaining apartheid system on earth (as defined bu the UN Convention on the Suppression of the Crime of Apartheid and Racial Discrimination). Israel's UN ambassador met with major American Jewish organizations telling them to work hard to ensure there will not be passage of any votes on Palestine at the UN. Presidernt Obama met with 80 influential Jewish donors (who each gave $25-35,000 to attend the private dinner with the President) and Obama assured them that the US has iron-clad commitment to Israel. He stated to them that any differences with the current Israeli government are not about goals and strategies but merely minor tactical differences among close friends and allies. Money and weapons will keep flowing and American lives will continue to be threatened and shed for this Zionist cash. Fatah and Hamas are dragging their feet and have yet to follow on their promises of putting together a unity "authority" (although the term is misleading as there is no authority under occupation) let alone allowing for a constitution of a representative Palestinian National Council (the main demand of the Paestinain people). Israeli apartheid system continues its ethnic cleansing. Last week dozens of structures for poor bedouins were demolished rendering nearly 100 homeless. The apartheid Knesset is debating new racist laws to punish free speech and any NGOs that do not accept apartheid/refuse to acknowledge the Jewish nature of the state. The apartheid regime continues to hold thousands of Palestinian political prisoners and continues to deny basic human rights (like the right to return to one's home and land or the right to travel free in one's country). Further, the despotic regimes in Syria, Bahrain, Yemen, Morocco and elsewhere continue to torture, kill, and imprison their citizens who dare call for democracy. Greece is being threatened about its loans unless it joins the US/Israel to stop the freedom flotilla. Turkey's elections consolidated power in the ruling party which now felt a bit freer (or so we are told) to bend to US/Israel pressure to a) stop the Freedom Flotilla II, and b) drop its demand for an apology and for lifting the siege on Gaza (after the execution of 9 Turkish passengers in International waters last year). But all these political shenanigans can be stopped when enough people say "enough is enough" and demand all these governments comply with International law and human rights. The brave pioneers of the world-wide people movement/Intifada who have worked for years urge you to join them. They celebrate and consolidate success in Tunisia and Egypt. I send example regularly of people power and today I send you a few more links. Action is the best antidote to despair. Silence is complicity. "From July 8-16, I will join hundreds of internationals for a week of solidarity actions in coordination with 15 Palestinian civil resistance organizations in the occupied West Bank and East Jerusalem…"
Conference de presse de Mazin Qumsiyeh, le 31 mai à Berlin. Yes, it is true that our struggle is more difficult than what transpired against apartheid in South Africa. Yes, it is true that our "leadership" has been reduced making weak declarations in fancy hotels and conference centers and to the media. This "leadership" is paid handsomely for doing nothing useful to change the political discourse or even increase the cost of this colonial Zionist venture. Worse yet, a good segment of this "leadership" actually aids and abets the occupiers. Salam Fayyad who worked at the World Bank and the International Monetary Fund (IMF), declares that he is fully in favor of the appointment of the head of the Central Bank in Israel as head of the IMF! He also worked hard to get funding to pave alternative roads that made it easier on the apartheid system isolating Palestinians in cantons than need not interfere with the plans to control the natural resources and best lands of the West Bank. And then there is Mahmoud Abbas who declared on more than one occasion and also even signed a provisional agreement with Israelis that also declared that refugees need not return to their homes and lands but only to the demilitarized denuded bantustan called a Palestinian state. Abbas also declared repeatedly that his options are negotiations, negotiations, negotiations. He and his associates (Saeb Erekat, Abu Ala' etc) have been negotiating for 20 years with the only tangible accomplishment being giving Israel economic and diplomatic space to consolidate Zionist colonialism. But this era of Israeli colonial superiority must and is coming to an end. While we in the civil society still hope for these "leaders" to change their ways, we have not been waiting. We have been acting and must act more. The upcoming escalation in confrontation will not be between states nor will it be with "insurgency" in its classic sense. What we see instead is a growth in boycotts, divestment, and sanctions and what transpired by freedom flotilla I, events of May 15, June 5th, the upcoming freedom flotilla II, and July 8-16 are so critical. We have individual and collective responsibility to change things by moral and determined ways. The other options have been proven catastrophically negative: relying on politicians (elected or self-appointed) or on the vagaries of shifting military capabilities (a dangerous development in the era of advanced science that makes development of weapons of mass destruction relatively easy even for small state and non-state actors). Let no one have any illusion: we are coming to a major confrontation. It can either be 1) a civil confrontation where civil society wins the struggle because it got engaged in these tactics of strong and determined popular resistance, or 2) it can happen via armed insurgency that uses modern technology to challenge conventional military forces. Hezbollah in Lebanon provides a model of mixing the two but with more reliance on the second. In challenging local dictatorship, we saw the power of civil resistance in Egypt and Tunisia. Challenging colonialism successfully happened with a mix of the two in Algeria (liberated in the 1960s) and South Africa (more recently). But the mix in South Africa was improved thanks to International civil participation. Each situation is unique and our local history here and the upcoming confrontation will also be unique to Palestine and different than in these other places. But it is clear that we have a responsibility as individuals in our society to try to shape the coming confrontation so that it is not catastrophically violent (i.e less "military might makes right" and more "people power"). Our future as humans depends on us working together to change our circumstances. Those who think they can afford to sit and wait (and watch TV news) will miss the moving train of justice and will regret their apathy. We Palestinians must carry the bulk of the weight (I remember the image of the old man carrying Jerusalem and Palestine on his back). But we humans are all responsible. We cannot be lulled by "humanitarian aid" or by "state" and non-state structures that give the illusions of safety and security whether in the US, Europe, Australia, the apartheid state of Israel, or in the bantustans called a Palestinian state. Everyone knows that that old system merely makes the rich richer, the poor poorer, destroys our environment, and lets us have fake elections between waves of certain economic downturns and the occasional war or terror attack that aims to distract us. I get up too early for my talk about popular resistance in Palestine. I could not sleep well. I kept thinking about the upcoming demonstrations Today (Sunday) wity family and friends participating. How many will be killed and how many will be injured. Only later in the day will I find that out (5 murdered, many injured, several friends arrested). But for this Sunday, I am sadly not with them. I am here at 7 AM walking around a lake, thinking and anticipating and then lecturing to 100+ Swedish activists. Intricate pattern of the ripples on the surface of the water in the early morning light contrast with the Tsunami of thoughts running through my mind. The green carpeted forest is punctuated occasionally by hues of purple and yellow flowers. But my mind has images of walls, barbed wires, uniforms of border police, young faces gathering bfore the demonstration in anticipation of tear gas, rubber coated bullets, and dum-dum bullets. Some 20 ducklings in two groups are faithfully following their parents in an orderly march on the surface of the lake. But it is the march of young students 6-20 year olds haphazard and zigzagged down the hill in Al-Walaja that I am thinking of. I close my eyes to take in the sounds. Gentle sounds of water bobbing on a stone near me. Silence outside but my mind recalls the deafening thuds of stun grenades, the volleys of tear gas canisters, loud piercing noise of the Israeli jeeps. A bird chirps on a pine tree calling for love then falls silent. My brain replays conversations with Israeli apartheid soldiers and with Palestinians anxious for their abducted loved ones. A bumble bee lands and takes off near me; the buzz of its wings seem more majestic than the lake’s feeble whispers. Then it is gone. I recall large angry flies in holding cells and on the bridge to Jordan. I feel and smell the fresh clean air occasionally scented with a whiff of Pine oils, dashed with a tiny pungent leaf of aromatic plant. I even catch a whiff of burned wood. A nice smell actually as a young Homo sapience starts a wood fire to cook a meal. But again our memories interfere with our senses. My mind gives me the smell of tear gas, human urine, sweat, and pepper spray. I reach down and pick a handful of decomposing leaves and soil. Sadness, death and rebirth, pain, beauty, and struggle form a complex of art that I do not understand. Maybe it is my lot in life.. or maybe it is life..
After breakfast, we talk about history and direction of popular resistance but my mind is still back home. In the coffee break I check the email and the news. Yes, many killed, many injured in the global uprising that is beginning to pick-up steam. An email from an aunt of Munib Al-Masri, severely injured in the May 15 peaceful demonstrations (see copy below). I did not know Munib himself but I know many of his relatives. But now we have little time to think. Back to the conference and recruiting Swedes to join the July 8-16 actions (see PalestineJN.org). Lots of interest and really good decent concerned people. My spirits are lifted. Life goes on. Someday I hope to return to this beautiful country just to enjoy nature without the intrusion of symptoms of apartheid. Maybe even to celebrate and show off two pieces of torn walls, the one I acquired in Berlin and one from the larger wall that will tumble in Palestine InshaAllah very soon. Stay tuned. Stay human. As some of you may know our 23 year-old nephew Munib Masri II was shot in the back by an Israeli soldier last Sunday in Southern Lebanon during a peaceful demonstration to commemorate the Nakba of 1948. He is miraculously alive, and has undergone multiple surgeries and had his left kidney and spleen removed. He is still in intensive care - it is going to be a long road to full recovery, but we are hopeful. In Lebanon there have been 12 killed, and 112 wounded. Our thoughts are with them and their families as well. The bullet was a dumdum bullet, which is designed to enter the body and splinter into multiple lethal fragments. It took a 7-hour surgery just to clean out the debris, gunpowder, and shrapnel that was left behind by the bullet. This was after the lifesaving surgery done in a tiny government hospital in a village in south Lebanon. The mood was of excitement and hope. He was part of a bus full of College friends, dressed in a polo shirt and jeans, they were laughing and stopping for coffees on the way. What happened in 1948 is called The Catastrophe, but every day since has brought us fresh catastrophes. Munib is not the first unarmed civilian to be hit by soldiers. But, if we work towards it, he could be the last. If you could forward this on to anyone you know who would like to help place an article, write a feature, or do an interview it would be greatly appreciated. I continue to be sad, shocked but also inspired by what I see and hear in my working tour in Germany. I remain cautiously optimistic because lessons of history, as sad as they are, provide an unmistakable map for the future. Hitler (and Zionists) who aimed to leave Europe with no Jews have failed. Here in Germany is the fastest growing Jewish population on earth and more than half of them come from Israel (the supposed haven of Jews). Many of the activists for human rights here are ex-Israeli or ex-Zionist Jews. Gideon Levy explains in Haaretz this week how and why Israelis are getting foreign passports at unprecedented rates. As you examine the sites of former Nazi interrogation camps and as you look at pictures and read stories of the past, you are struck by the idiocy of humans who thought they could get away with treating fellow human beings with such indignities. There are enough resources for everyone on earth but greed and racism seem to dog our species and rear its ugly head here and there. The folly and arrogance of power confronting indifference and subjecting fellow humans to such cruelty is beyond description in certain periods of our history. In other periods, denial (of the Nakba or of the Jewish holocaust) can hurt the feelings of survivors. No human can claim they are not impacted by these things. But I as a Palestinian found the microcosm of this all too human history truly disturbing and resonating with our reality. Today, it was reported that the government of Israel is considering a new plan to move 30,000 Bedouins to concentration areas from their unrecognized villages in the Negev because of “environmental reasons”. Seventy years ago, thousands of Roma (Gypsies) were also relocated to improve the environment. Gypsies (Roma) are still treated bad in Germany and they are still around despite those early attempts to clear them out. Seven years ago, uprisings in the Jenin Refugee Camp and in Nablus old city (ghettos) were put down brutally, sixty years before, an uprising in Warsaw ghetto was put down. Stories about Jewish collaborators with the Nazis bear uncanny resemblance to descriptions of Palestinian collaborators with Zionist plans (including stories of extortions, use of family members, use of medical or economic levers etc). Walls three meters high in Berlin are mostly gone but walls 8 meters high in Palestine still stand. I bought a piece of the wall in Berlin. 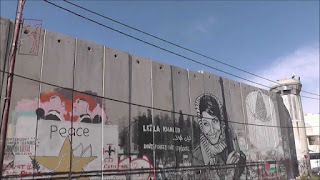 I imagined that very soon, some Palestinians will be making a lot of money selling pieces of the Israeli apartheid wall. Dreams and memories and lessons and tears and hopes know no state boundaries and no national or religious boundaries. I recalled the remarkable book by Jewish theologian Marc Ellis “Out of the Ashes” and his message that the lessons of horrors should be “never again to all humans” not “never again to my group.” That is the lesson I hope will finally sink in to all of us. We held a press conference about planned actions of bringing Freedom Flotilla II to Gaza in late June and bringing hundreds of peace activists to the rest of Palestine July 8-16 (sponsored by 30 Palestinian groups so far and supported by hundreds of organizations around the world, see PalestineJN.org). The press conference was on the same day as the day that one year ago, Israeli navi commandos attacked humanitarian ships of the Gaza freedom Flotilla murdering 9 activists and injuring many. All of us are inspired by the determination of the International civil society (people of all walks of life who act on their conscience) to keep working for peace with justice. This determination stands in contrast with the collaboration of Western governments in supporting the last remaining apartheid colonial state. As we see in the Tunisia, Egypt and the rest of the Arab world, we can safely bet on the power of the people. Actions around the world: June 5th in front of Israeli embassies and consulates and at major apartheid barriers (borders, checkpoints etc). For example Sunday there will be an event in Al-Walajah starting at 10 AM.